How can you embrace an enemy of the USA? More important–why would you? If these questions have not been outright asked of me–they have been implied. Why I chose to speak highly of China, and its people, is something that I do willingly and with pride. I am not the Manchurian Candidate. I was never brainwashed during my visits there. I was not tortured or forced into my feelings in any way. Subliminal messages were not piped into my hotel room at night. I did not have bamboo shoots shoved under my fingernails. I was not drugged or impaired in any way unless it was done willingly by drinking too much of that fine Chinese beer. Within my small circle of business contacts, experiences, and associations I would say it is Western business people who are trying to brain wash the Chinese. As I developed my business relationships, I have read of those that experienced failures mainly because Western companies tried to “Westernize” their Chinese business partners rather than adapting to their Chinese partners way of doing business. Maybe it has been different for others who have done business within China but for me, personally, my successes came from letting the Chinese conduct business in “their way”, and I tried to educate my customers in their methods and ways. I won’t say it was not frustrating at times—in fact, it was frustrating most of the time. However, in the end, it was what worked best for me while others failed. Honor and “saving face” are very important to the Chinese—I tried not to put any of my associates in a position that threatened either. Again, just from my experience, I have to say that people from any part of the world can work together to achieve a common goal if all parties can be flexible and understanding. From my perspective, this is the true receipt for success among the world’s population. 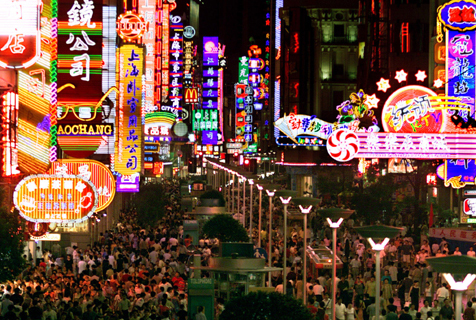 I have been traveling to China since 1998 and had a business and personal relationship there since 2003. I have a business that is based on these relationships built up over the years—they continue today. I am not a young man—but even at 64, I know that the relationships I have made there are once in a lifetime treasures. I have found China and its people to be nothing like they are portrayed in the media. I will—as best I can recall — write about specific experiences and places, I have visited. Unfortunately, the original computer that I had when I started my China business fried its hard drive, and although I was warned, I never backed up my material so I have lost many excellent photos. However, I have enough remaining pictures to tell a story or two. One of our US government officials reportedly made a comment with the word “retarded” in it. There was also an attempt to make a joke using “Special Olympics” on a TV show in the past. Why do people say the things they do? Why have I said some of things I have said? When I have made comments at the expense of others, I thought either it was funny or it made me feel important in some perverse way. As I have gotten older, experience has taught me to think before I speak—at least a little more than I did in my younger years. What someone says as a casual statement—or an attempt to make a joke—can offend others on a multitude of levels. After having an association with specific Chinese people since 1998, I take great offense when someone says something like this to my face or within earshot. To me, they do not all look alike. They may all have similar physical features but I see each person I have met in my business dealings as a singular and unique individual just as I would feel about anyone I met throughout the world. As you meet people—speak with them—get to know them, I think everyone has personal features, mannerisms, personalities that make them different from other people in the world. In terms of my feelings for China, and its people, it is only based on those who I have met personally. As I view it, there are values that I have found all Chinese possess—the reverence of family and respect for their elders. I wish these values were more evident in the US. With 1.3 billion people milling around China, how can they have these values when there are so many of them? I once worked with a product that was to replace the toxic cleaner Nitric Acid. In most instances, the shipping tanks in the ocean liners have to be cleaned out after they are emptied. They send “Chinese People” into these tanks to spray them out. One contact actually said, “There are so many Chinese that when one dies from being exposed to the Nitric Acid there are a million more to take their place.” It was all I could do to keep my hands from going around his neck or punching his lights out — being older at the time, I felt he was not worth the hassle. I believe the respect for family—and elders—in China is not something just confined to my small group of acquaintances there. I think this is something that is countrywide, and I feel this is a virtue beyond description. 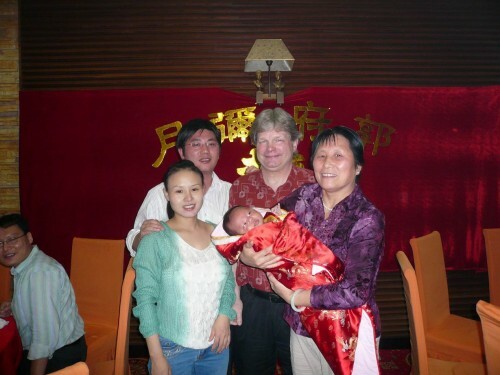 During one of my visits, my friend and primary associate invited me to a party to honor his new young son. We held this event in a large, private room within a very nice restaurant. There were many people there, and as I have written regarding other situations, I was again the only non-Chinese in the room. I felt completely at ease and extremely honored he would invite me to such an important “family event”. The photo above shows me with my associate, his wife, his mother, and his new young son. I did, and still do, feel like part of their family. To me they remain friends, family and associates, and they “certainly” do not all look alike to me!